Off road Jeep style trucks are some of the finest autos on the planet. The Magic Cars® 2 seater electric ride on Jeep style 4 x 4 for kids with remote control is second to none and will hold up to 105 pounds and fits 2 children. Yes, it has driver side and passenger side real opening doors, working stereo, working headlights, chrome gray wheels, real rubber tires, working headlights, working taillights, and a 2 child leather seat too! Measures a huge 4 feet long and over 2.5 feet wide. Holds up to 105 pounds and reaches speeds of 5.5 mph and is great for children ages 1-10 years old. All children will deeply enjoy this ride on Jeep style truck with 2 extra large 12 volt engines give you more than double the power of normal cars, superb detail, and upgraded Playtime Power Pack which will give you continuous run times of about 2-3 hours. 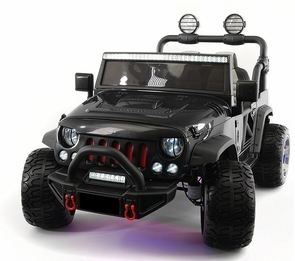 You have found the BIGGEST CLASS 2 seater battery powered ride on Jeep style trucks make for amazing fun inside or outside of the house and has plenty of power on grass, dirt, pavement, and even light snow! High attention to quality manufacturing in black, red, or white colors. Most cars on the market and traditional ride on vehicles at Toys R Us have (1) 6 volt motor and (1) 6 volt battery pack which is not enough power. Not your new truck so buy today and you will receive the 12 volt battery upgrade which will give you continuous run times of about 2 hours! Almost sold out again, please place your order today! Drive forwards, backwards, left, and right. Want more? This is ride on car gives you the option of remote controlling it with the included wireless transmitter. That's right you can operate this ride on like a huge RC car with your child in it. Or flip the switch on the inside of the car to give your child full control over the steering wheel and pedals. Great feature for training new drivers. Plus you can select 3 different speeds in order to limit the speed for new drivers. Do not be fooled by imitators, only official Magic Cars® sold on TrendTimes.com come with the Best In Class 1 year bumper to bumper warranty for free! Please order today as this car will be sold out again. For even more fun we outfitted this Jeep style ride on 2 seater with a working radio, leather seat for 2 children, MP3 input so you can pump the jams to your heart's content, front and rear shock absorbers, USB input, SD memory card slots, and smart battery charge to prevent overcharging. Perhaps you grew up around 4 x4's and Jeeps, so you know the history behind the truck. If not, now is your chance to start learning with your child as they cruise the house or neighborhood in true style. Watch the official Trend Times Magic Cars® remote control ride on RC car commercial below and enjoy what is so amazing today. Feel good! This Magic Cars® model arrives free with the best in class 1 year bumper to bumper ride on car factory warranty. These ride on cars are made to demanding specifications including a realistic gear stick for an added effect. Measures a huge 5 feet long and over 3 feet wide. Holds up to 105 pounds and reaches speeds of 6.5 mph and is great for children ages 1-10 years old. Extremely durable and reliable thanks to the 2 12 volt motors and oversize 12 volt rechargeable battery pack! Don't be fooled by imitators. Buy today and feel good! Order now and this Magic Cars® model will arrive free with upgraded best in class 1 year bumper to bumper ride on car factory warranty. That's an extra 150 dollar value for free if you buy right now. Working great and it is perfect for our 1-year old son as we were easily able to control the movement through the wireless remote control. Now he is getting familiar with driving and sometimes we let him drive from within inside the car with the steering wheel. He thinks he is driving when we control it! Fun. Cute design, yet really well built. Superb detailing. I have to admit that I love it just as much as our son. He has a permanent smile on his face every time he drives his car. I was exactly looking for a 2-seater toy car as we have two little munchkins at our home. One drives in the morning while the other sits on the side seat, and exchange seats in the evening sessions. Relief! Well, I am totally impressed with everything this Jeep truck has got. Stylish design, great construction, and other features like working front lights. rubber tires, and radio, etc. Seriously a ROCKSTAR!